16th century Spanish explorer Juan Ponce de León looked and looked but never did find the Fountain of Youth, a spring rumored to restore one’s youth if you bathed or drank from its waters. If he had, I might have interviewed him for this story. Sunday night, another symbol of youth beckons skywatchers the world over. 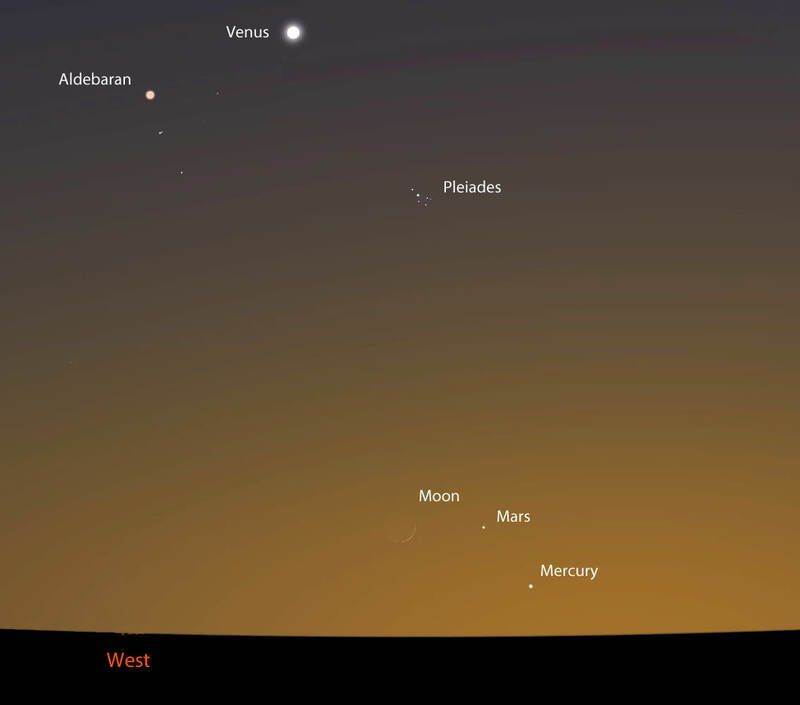 A fresh-faced, day-young crescent Moon will hang in the western sky in the company of the planets Mars and Mercury. While I can’t promise a wrinkle-free life, sighting it may send a tingle down your spine reminding you of why you fell in love with astronomy in the first place. The Moon reaches New Moon phase on Saturday, April 18 during the early afternoon for North and South America. By sunset Sunday, the fragile crescent will be about 29 hours old as seen from the East Coast, 30 for the Midwest, 31 for the mountain states and 32 hours for the West Coast. Depending on where you live, the Moon will hover some 5-7° (three fingers held at arm’s length) above the northwestern horizon 40 minutes after sunset. To make sure you see it, find a location with a wide-open view to the west-northwest. While the crescent is illuminated by direct sunlight, you’ll also see the full outline of the Moon thanks to earthshine. Sunlight reflected off Earth’s globe faintly illuminates the portion of the Moon not lit by the Sun. Because it’s twice-reflected, the light looks more like twilight. Ghostly. Binoculars will help you see it best. Now that you’ve found the dainty crescent, slide your eyes (or binoculars) to the right. That pinpoint of light just a few degrees away is Mars, a planet that’s lingered in the evening sky longer than you’ve promised to clean out the garage. The Red Planet shone brightly at opposition last April but has since faded and will soon be in conjunction with the Sun. Look for it to return bigger and brighter next May when it’s once again at opposition. To complete the challenge, you’ll have to look even lower in the west to spot Mercury. Although brighter than Vega, it’s only 3° high 40 minutes after sunset Sunday. Its low altitude makes it Mercury is only just returning to the evening sky in what will become its best appearance at dusk for northern hemisphere skywatchers in 2015. Right now, because of altitude, the planet’s a test of your sky and observing chops, but let the Moon be your guide on Sunday and you might be surprised. In the next couple weeks, Mercury vaults from the horizon, becoming easier and easier to see. Greatest elongation east of the Sun occurs on the evening of May 6. Although the planet will be highest at dusk on that date, it will have faded from magnitude -0.5 to +1.2. By the time it leaves the scene in late May, it will become very tricky to spot at magnitude +3.5. Mercury’s a bit different from Venus, which is brighter in its crescent phase and faintest at “full”. Mercury’s considerably smaller than Venus and farther from the Earth, causing it to appear brightest around full phase and faintest when a crescent, even though both planets are largest and closest to us when seen as crescents. Venus makes up for its dwindling girth by its size and close proximity to Earth. It also doesn’t hurt that it’s covered in highly reflective clouds. Venus reflects about 70% of the light it receives from the Sun; Mercury’s a dark world and gives back just 7%. That’s dingier than the asphalt-toned Moon! Good luck in your mercurial quest. We’d love to hear your personal stories of the hunt — just click on Comments. I put down down the snow shovel to give my back a rest yesterday evening and couldn’t believe what I saw. Or didn’t see. Where was Venus? I looked to the south above the tree line and the goddess was gone! Sweeping my gaze to the right I found her again much closer to the western horizon point and also much lower. As 2013 gives way to the new year, Venus winds up its evening presentation as it prepares to transition to the morning sky. Catch it while you can. Each passing night sees the planet dropping ever closer to the horizon as its apparent distance from the sun shrinks. On January 11 it will pass through inferior conjunction as it glides between Earth and sun. Come the 12th, Venus nudges into the dawn sky – don’t expect to see it with the naked eye until around midmonth, when it’s far enough from the sun to bust through the twilight glare. Though the planet is departing, don’t let it disappear without at least a glance through binoculars. As conjunction approaches, Venus gets as close (and as large) as it can get to Earth and displays a most attractive crescent phase. Even 7x binoculars will show its thinning sickle shortly at dusk. Tonight (Dec. 27) Venus measures nearly 1 arc minute in diameter or 1/30 the width of the full moon and shines brightly at magnitude -4.5. As the planet drops ever lower, the crescent grows both larger and thinner. A few days before conjunction, a telescope will show it extending beyond the usual 180-degree arc as sunlight beaming from behind Venus is scattered by the planet’s thick cloudy atmosphere. When the air is transparent and seeing steady, amateur astronomers have photographed and observed the crescent wrapping a full 360 degrees around the planet’s disk – a sight quite unlike anything else in the sky. After final farewells late next week, we’ll look forward in the new year to welcoming the goddess in her new guise as morning star. The 13-km-wide Phobos has been spotted several times before by Mars rovers, most recently during a solar transit on September 13 (sol 37) but I’m not sure if it’s ever been clearly captured on camera during the day before (i.e., not passing in front of the Sun.) If not, this will be a first! See the latest news from the Curiosity mission here. Added 9/28: According to Universe Today publisher Fraser Cain, this is “the most dramatic space picture of the year”… whether you agree or not, hear what he had to say on this and other recent news during the September 27 episode of the Weekly Space Hangout.